Last month ASLEF members at Acton Town voted by 98% in favour of strike action in a dispute over the application of the SPAD policy on the line. Instead of sitting down to find a way to resolve this dispute, London Underground management have not even offered to meet to discuss it. Your Executive Committee have now decided to give London Underground notice that our members at Acton District will not be booking on for duties starting between 00:01 and 23:59 on Wednesday 28th March 2018. Taking strike action should always be a last resort. but when management are not even prepared to take the opportunity to resolve issues by discussion and negotiation then we have to be ready to take action. This dispute is not about one individual or one case. It is about defending our agreed policies and procedures for everyone. If management can pick and chose who to get rid of regardless of fair and equitable agreements, then every driver is at risk. This dispute will now be escalated to other depots on the SSR lines as requested by our branches if management are not prepared to find a resolution. As far as I'm aware its not an issue on the Central but then we're an ATO line so we don't have much of a SPAD problem. It could just be Acton Town management who are trying to be clever with the procedures while Upminster, Barking and the rest are playing by the book. Tube drivers have voted to stage a 24-hour strike next week after accusing TfL of treating their colleague unfairly over alleged safety breaches. Commuters face disruption on the District line after drivers from the Aslef union voted to strike on March 28. A source from the Aslef union told the Standard that more than 100 train crew were expected to walk out from the Acton depot because management had treated a driver unfairly. What happened? Did the driver get dipped to stations? I understand the individual had three safety related incidents, was called into an interview (without Union representatives) and was warned that another incident would put them in breach of the agreed SPAD Policy. A Management suggestion of taking alternative employment or facing ‘the inevitable’ fourth incident and instant CDi was met with agreement with the individual to take alternative employment. This is against the said agreed SPAD Policy. Action on 28 March SUSPENDED, new dates to be announced. What percentage of District drivers are based at Acton? ASLEF members at Earls’ Court will receive ballot papers this week in the dispute over the application of the SPAD policy. 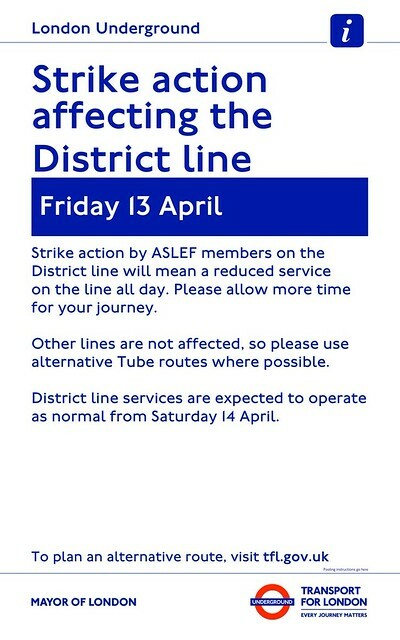 Members at Acton Town are due to strike on Wednesday 11 April. The Acton Town action has been moved back to Friday 13 April as the Earl’s Court ballot is due to be declared on 11 April. The impact is expected to be minimal in central London due to normal service on the Circle line, with regular services between Gloucester Road and Tower Hill, but there will be more time between trains going to all western branches of the District line via Earl's Court and east of Tower Hill. There will be no services to Kensington (Olympia), however London Overground and Southern services will be calling at the station as usual. TfL Travel Ambassadors will be at key locations to provide travel information and advice to customers. "I apologise to customers for the disruption this completely unnecessary strike will cause and call on the unions to continue working with us to ensure the safety of our customers and staff"
Any ideas of the possible service pattern? I assume that there will need to be a special timetable in place?